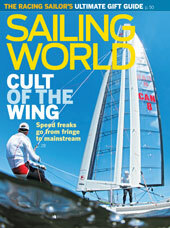 For more than 30 years, Sailing World Magazine has been the place to go for news and information on sailboat racing at every level. Covering classics such as the America's Cup and the Whitbread, the Olympics, PHRF and IMS racing, speed record challenges and college racing, Sailing World Magazine also enjoys contributions from some of the world's top sailors. Ed Baird, Dave Dellenbaugh, Morgan Larson, Dr. Stuart Walker, and many others provide how-to articles and other features focusing heavily on technique.